Genetically Modified Organisms (GMOs) – Planned Sterilization of Humanity? 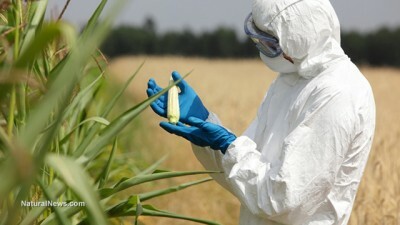 Severe health risks of Genetically Modified Organisms (GMO) are not new. Studies by scientists among others in France, Germany, Austria, since at least the 1990s, pointing to several levels of health dangers to mankind abound. A recent study released by Egyptian researchers found that rats fed a GMO diet suffer from infertility, among other health issues. In the US similar studies were muzzled by Monsanto and the Monsanto staffed FDA. In a 2011 paper the Institute for Responsible Technology – IRT refers to 19 animal studies linking GMOs to mostly liver and kidney organ disruption. This is still a (mostly unspoken) key objective of the elite, associated through different semi-secret organizations like the Bilderbergers, the Council on Foreign Relations (CFR), the Trilateral Commission, the British Chatham House, the Economic Forum (Davos), and others. GMOs are based on two strands; one involves insect resistance, the other is herbicide resistant and more dangerous, because it is glyphosate-tolerant. Glyphosate, known under its trade name ‘Roundup’, is however absorbed in the food fibers and has devastating health effects. The herbicide is an endocrine-disruptor, a chemical that at certain doses can interfere with the hormone system of mammals. These disruptions may cause cancer, infertility, miscarriage, birth defects and full sterility by the third generation, as the Russian study clearly demonstrated. In his eye-opening 2007 book Seeds of Destruction: The Hidden Agenda of Genetic Manipulation, F. William Engdahl points to food control and depopulation as the strategic key objectives of GMOs as put forward by Henry Kissinger already half a century ago. A less populated Third World will give the US and world elite easier and cheaper access to needed raw materials, allowing the ‘chosen few’ to maintain a lifestyle of exuberant luxury and resources abuse. “We are leading the world into the sixth mass extinction of life on this planet. . . . Human behavior is undermining the web of life.”. Worse is to come, if and when the Trans-Pacific Partnership (TPP) agreement is ratified by the US and its eleven Pacific partners. The TPP – much like the TTIP (Transatlantic Trade and Investment Partnership, linking the US with the 28 EU countries) – is negotiated behind closed doors. The chief agricultural negotiator for the US is the former Monsanto lobbyist, Islam Siddique. The two monster trade agreements would deprive governments from regulating transnational corporations’ activities, to the point where the rights of corporations would supersede sovereign nations laws. Corporations would be able to set up private courts that may rule a country liable for lost profit due to legislation that may interfere with their activities. This would particularly apply to biotech agriculture. GMOs could no longer be forbidden by individual countries. They are integral parts of the two giant trade agreements which the US is attempting to ram down the throats of their ‘partners’ – and may do so in the general realm of vassalage which has been cultivated by Washington’s threat and sledgehammer politics – “You are either with us or you are against us” – and the latter is usually punished with devastating sanctions, if not with death of errant, non-compliant leaders. The objective of depopulation is alive and well – and being implemented under our eyes; and We, The People, are blinded by the steady drop-by-drop of propaganda that makes us believe that these trade agreements will resolve the world’s food problems, will eliminate famine. What they will eliminate after a few generations is peoples’ fertility. This, coupled with the constant and continuous wars on terror and financial assassinations of entire countries (see Greece) by the so-called Bretton Woods Organizations, IMF and World Bank, working hand-in-hand with the FED and Wall Street, may eventually succeed in drastically reducing world population – if We, The People, do not wake up. Waking up to a new form of agriculture is crucial. Back to nature and earth-friendly farming, as well as away from globalization to the notion of ‘local production for local consumption’. Russia has a strict ban on GMOs. Russia is producing about 40% of its food by permaculture methods on simple garden plots. According to Natural Living, 80% of the country’s fruit and berries, and 66% of vegetables and about 50% of the nation’s milk are produced on dacha-type plots. It is not too late to get away from GMOs, from planned sterility and from depopulating the globe for the benefit of a tyrant elite. But, We the People, have to wake up, take back the sovereign control of our nations from the vassal leadership which Washington has discretely, almost imperceptibly placed at the helm of the 11 TPP and the 28 TTIP nations by stolen or manipulated elections or outright ‘regime change’. The breaking up of the Eurozone and the European Union – both of which are in dire straits – might be the beginning of a new era of self-determination.